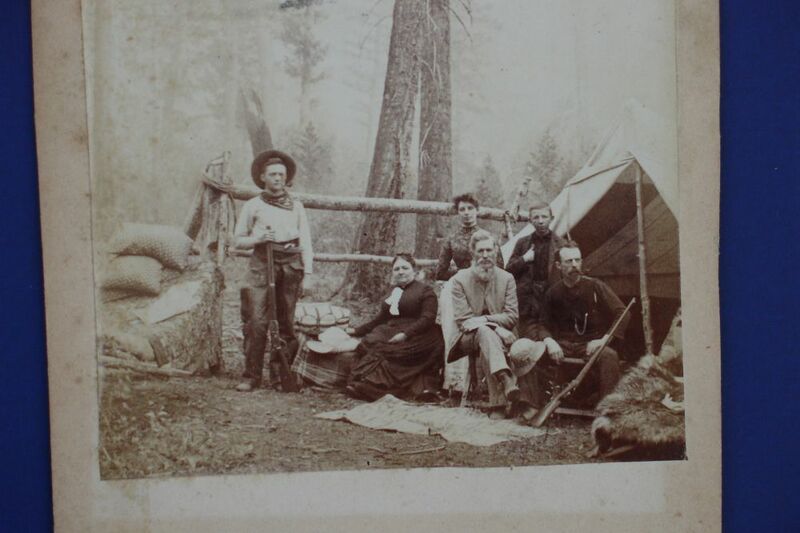 This is an interesting 19th century photo of a family of homesteaders or pioneers posing in front of a make-shift tent. I have no idea where this was taken but there appear to be some evergreen or pine trees in the background. Fortunately, everybody in the photo is identified. 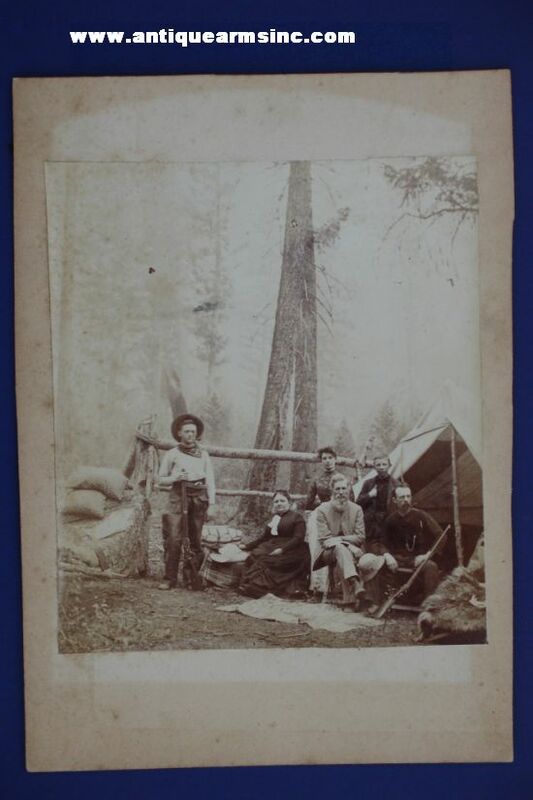 The young man on the left clutching the barrel of his Winchester 1876 rifle is noted on the back of the card as "J.B. Bradford -Cowboy" followed by "Papa, Ida, Ma, & Bob to his left. 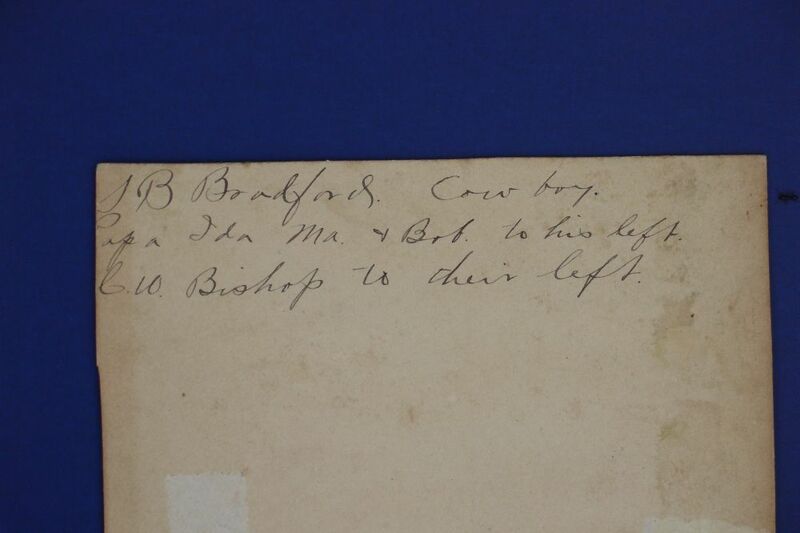 "CW Bishop to their left" . The cowboy is quite young but judging from his clothes, that certainly appears to be the case. He's wearing a cowboy hat, a handkerchief around his neck, a catridge belt with a pocket pistol tucked inside, leather chaps w/pockets, and boots. If you look closely, you can even see his rope thrown over the fence rail. I'm usually a bit more skeptical of photos of quote "Cowboys" as many were taken in studios with subjects posing as Cow-hands through the aid of a photographer's props. This photo is a bit different in that its taken outdoors in front of their dwelling and his equipment is accurate. The 1876 Winchester appears to be a standard sporting rifle with 28" barrel and full magazine tube. There is also a man to the far right (C.W. Bishop---we believe) posing with what appears to be a Winchester Model 1885 Lo-Wall rifle. At least that's what I think it is...it could also be a Stevens but I'm pretty sure its a Lo-wall with a tang sight. There are also two women, a man, and a young teenage boy. One woman seems to be a proud quilter...note her pillows stacked to the far left and some more of her work beside her and a blanket laying out in front of the family. You can also see what appears to be a bear pelt in the bottom right corner of the photograph. The photo is in very good condition...it was once inside a frame as the matting has darkened slightly around the edges. No rips or tears. The actual image measures 3.75" x 4.5". Neat photo that should be researched further.